On 20 April 1861, when Virginia authorities took over the Norfolk Navy Yard after its evacuatuion by Federal forces, they found, among other valuable items, the hulk of the steam frigate USS Merrimack. Though burned to the waterline and sunk, the big ship's lower hull and machinery were intact. During the remainder of 1861 and the first two months of 1862, the Confederate States Navy raised, drydocked and converted her into a casemate ironclad ram, a new warship type that promised to overcome the Union's great superiority in conventional warships. Placed in commission as CSS Virginia in mid-February 1862, the ship's iron armor made her virtually invulnerable to contemporary gunfire. She carried ten guns of her own, a seven-inch pivot-mounted rifle at each end and a broadside battery of two six-inch rifles and six nine-inch smoothbores. Affixed to her bow was an iron ram, allowing the ship herself to be employed as a deadly weapon. Virginia made her first combat sortie on 8 March 1862, steaming down the Elizabeth River from Norfolk and into Hampton Roads. In a historic action that dramatically demonstrated the superiority of armored steam-powered warships over their wooden sailing counterparts, she rammed and sank the big U.S. Navy sloop of war Cumberland and shelled the frigate Congress into submission (CSS Virginia destroys USS Cumberland and USS Congress). In Washington, D.C., many of the Federal Government's senior officials panicked, convinced that Virginia posed a grave threat to Union seapower and coastal cities. They were unaware that her serious operational limitations, caused by her deep draft, weak powerplant and extremely poor seakeeping, essentially restricted her use to deep channels in calm, inland waterways. However, their worries were relieved the next day. When Virginia returned to Hampton Roads to attack the grounded steam frigate Minnesota, she found the Union's own pioneer ironclad, USS Monitor, waiting. A second historic battle ensued, with the two opponents firing away, without mortal effect, until the action ended in a tactical draw in the early afternoon of 9 March 1862. Over the next two months, the two ironclads kept each other in check. Virginia, repaired and strengthened at the Norfolk Navy Yard, reentered the Hampton Roads area on 11 April and 8 May, but no further combat with the Monitor resulted. As the Confederates abandoned their positions in the Norfolk area, Virginia was threatened with the loss of her base. After a futile effort to lighten the ship enough to allow her to move up the James River, on 11 May the South's formidable ironclad was destroyed by her crew off Craney Island, some six miles from where she had electrified the World through her battles of 8 and 9 March. 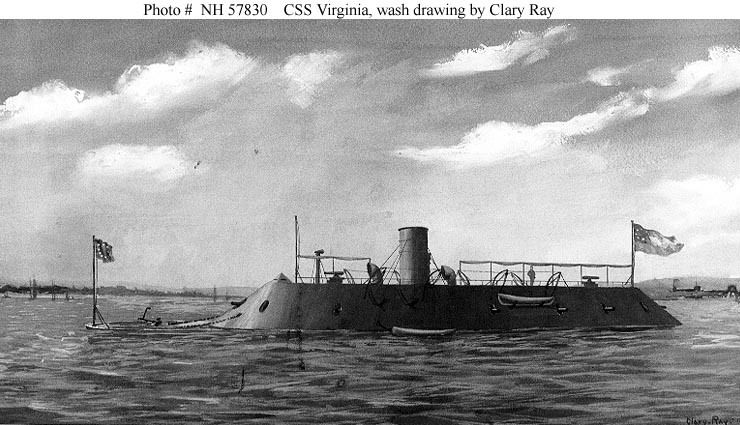 CSS Virginia's wreck was largely removed between 1866 and 1876. The majority of the ships ordered never reached America. Shipbuilding takes time, and as the war dragged on the European powers were persuaded by Confederate battlefield misfortunes and US diplomatic pressure that it was most expedient to deny the sales of such innovative designs as ocean-going ironclads. Like other out-manned and out-gunned powers, the CSA did have to resort to ingenuity and innovation.